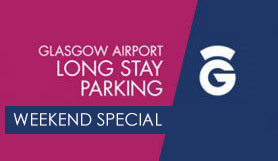 Official Long Stay on-airport parking located only 5 minutes from the terminal with frequent transfers. Special rate Non-Flex rate available at a cheaper price. Assistance may be available for disabled drivers and passengers. Please contact our Call Centre for more information. ON ARRIVAL: Number plate recognition in operation. Please wait for a ticket. If no ticket is issued press for assistanceON RETURN: At exit please insert your entry ticket for your booking to be validated. At the exit please insert your entry ticket for your booking to be validated. FROM ST JAMES INTERCHANGE: (J29 M8 East), take the exit for Glasgow Airport. Turn into the one way system, ensuring you move into the right hand lane. At the 1st set of traffic lights turn right. Proceed to the next r'bout turn left onto St Andrews Drive. At next r'bout turn right onto White Cart Rd. At next r'bout turn left onto Sanderling Parkway. At next r'bout turn left onto Abbotsinch Rd. At next r'bout turn right onto Arran Ave where you will see the car park. From Glasgow City Centre & East: Take Glasgow Airport exit (J28 M8 West), ensuring you are in right lane on slip road. At r'bout turn right onto Sanderling Parkway. At next r'bout go straight across. Next r'bout turn left onto Abbotsinch Rd. At next r'bout turn right onto Arran Ave where you will see car park. If using Sat Nav please use postcode PA3 2SW.